Ommegang | Beer Apprentice - Craft Beer News, Reviews, Interviews and Info. How’s everyone doing today? You guys ready for another craft beer review? 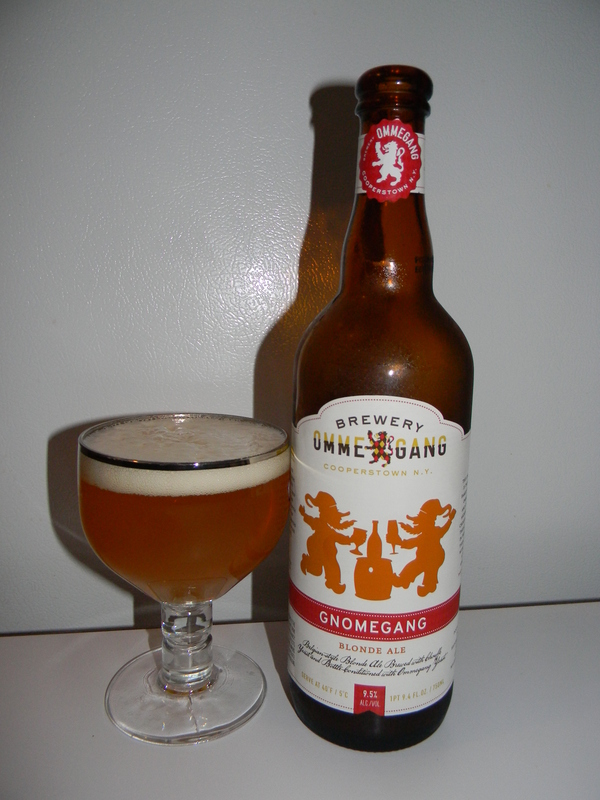 Well, today I’m going to be trying the Ommegang Gnomegang produced by Brewery Ommegang located in Cooperstown, New York. It’s been a little bit since I last had a beer from Ommegang. I’ve always enjoyed their brews fairly well, so when I saw the Gnomegang I figured I’d pick it up and give it a go. Let’s check on the website, ommegang.com, and see what kind of info we can retrieve about this beer. The cheerful gnomes of Belgian farmstead Brasserie d ‘Achouffe dropped by the Brewery Ommegang farmstead brewery in the summer of 2010. In appearance, Gnomegang is a rich, translucent gold, with a big, fluffy white head. The high-carbonation is readily apparent. The nose focuses on distinctive clove aromas, combined with yeasty fruitiness typical of Chouffe beers. Flavors include ripe fruit, clove, light caramel, non-cloying candy sweetness, smooth maltiness, and well-balanced hopping. Mouthfeel offers a big, round body with full, fine carbonation. The finish is dry and warming, lingering gracefully. It poured a semi-hazy, yellow to orange color with a white head. The cap was touch fizzy and soapy, but it was sized very well and the retention time was more than adequate. The lacing was also quite decent as a few rings of foam remained on the sides of the chalice as I sipped. The nose brought forth a bit of orange citrus and just a soft waft of banana. A spice of clove as well as some bready and biscuit notes were there too. The lightest lemongrass fragrance came about as it warmed and opened up as well. Not a bad bouquet at all I didn’t think. The flavor began with a strong bolt of yeast, bread and spice of clove and pepper. Banana and orange citrus took care of the fruit aspect while some sugary, sweet bubble gum savors gave it some additional complexity. Finally, a light relish of alcohol finished it off. The mouthfeel was medium bodied. Smooth, mostly dry and a touch crisp with a good medium strength carbonation. A little dose of warmth was felt from the alcohol and a solid amount of flavor was left behind on the palate after each swallow. No doubt about it. This was a very good beer and easily worth a try. It had a lot going on with both the aroma and flavor and the drinkability was decent enough. Some alcohol was found, but overall it was mostly well hidden. I’d have no trouble trying it again if it were available that’s for sure and if you guys happen to run across the Ommegang Gnomegang at your local bottle shop, pick it up, give it a go and see what you think. It’s not exactly “world class” in my opinion, however it makes for a fine experience. Hello everyone. Thanks for checking back in on another craft beer review. 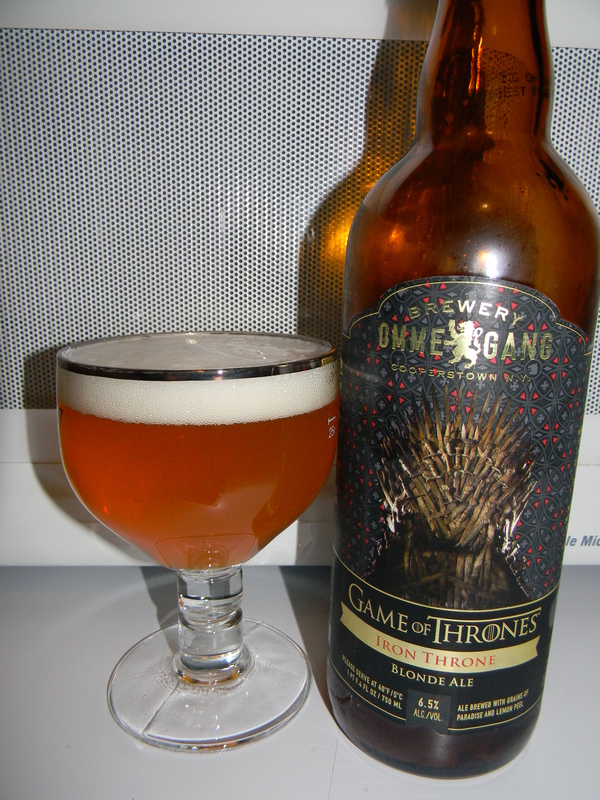 Today, I’m going to be trying the Ommegang Game Of Thrones “Iron Throne” produced by Brewery Ommegang located in Cooperstown, New York. You know, I’ve never even watched a single second of that show, but when the bottle was offered for purchase I decided to give it a try. It seems that all of the Ommegang beers that I’ve tried in the past have been solid enough, so it has to be decent right? Let’s see what the website, ommegang.com, has to say about this special release brew. Brewery Ommegang and HBO are partnering on a series of beers inspired by the critically-acclaimed drama Game of Thrones. Launching ahead of the season 3 debut on March 31, Iron Throne, a blonde ale, is the inaugural beer in the series and the result of a creative collaboration between Brewmaster Phil Leinhart and HBO. Ok. Now that we have the low down let’s give it a try. This libation came in a 25.4 oz. bottle and it possessed an ABV of 6.5%. It poured a hazy, golden orange to yellow color with a nice, bright white head. The texture was kind of smooth, yet kind of frothy, soapy and soft as well. It was sized very well and the retention time seemed pretty good to me. The lacing was more than adequate too. The nose brought forth some breads, yeast and wheat. Slight hints of lemon citrus intermingled with tones of coriander and pepper spice. It seemed a touch simplistic and restrained, however it was balanced very, very well. The taste and the aroma matched up near perfectly. I might say that the flavor was a bit more forceful though. Either way, I thought the pepper and coriander commingled with the bready/yeasty goodness nicely. The lemon citrus was duly noted again and added just a touch of sweetness. The mouthfeel was medium bodied. Smooth, dry and kind of crisp. The carbonation was little on the livelier side, although it did settle down some after I worked my way through the bottle. A nice shot of flavor was left behind for me to enjoy between sips also. Overall, I thought this to be a pretty good beer. It’s definitely a solid representation of the style that’s for sure. I didn’t necessarily think that it was anything extraordinary, but it was far from underscored. It’s a reliable and dependable take on a Belgian Pale Ale. One that would suit the Spring season soundly. The drinkability was high and with the not so robust ABV, a person could work their way through the entire bottle with relative ease. So, if you guys are able to procure a bottle of the Ommegang Game Of Thrones “Iron Throne”, pick it up and see what you think. Be sure to tell me of your opinion when you do. Hello everyone. For today’s craft beer review I’m going to be sipping on the Ommegang BPA (Belgian-style Pale Ale) by Brewery Ommegang located in Cooperstown, New York. We all know about Brewery Ommegang, however I don’t know much about this particular beer, so I’m just going to get right to it and see what kind of info I can find on the website, ommegang.com. This fine pale ale offers citrus and tropical aromatics coming from a well balanced – yet ample – hop character. It uses our own Belgian yeast, five malts, two hops, and plenty of patience. Finishing touches include dry-hopping with Cascade hops, and warm cellaring. This brew comes in a 25.4 oz. bottle and it has an ABV of 6.2%. The beer poured a hazy, pale orange to gold color. The head was off white, sized very well, smooth and a tad sudsy. The retention time was only average I thought, however it left behind some decent lacing. The nose brought forth a very, very nice dose of fruity citrus. Tropical fruits and maybe a little bit of apple, but the primary fruit was orange in my opinion. Some solid bready notes with that every present Belgian yeast. Some peppery spice added a nice compliment to some floral aspects. Towards the end I thought I got a hint or two of grapefruit also. Well balanced, even and not too overpowering on the fragrance. The taste was very fruity, floral and lively as well. The peppery spice seemed to be a bit more relaxed than I thought it might be, while the sweet orange citrus, apples, Belgian yeast and toasted biscuits helped to define the overall flavor profile. The bitterness was easily manageable, yet it maintained a sturdy “tickle”. Again, a very solid and worthwhile taste with this one. The mouthfeel was medium bodied. Quite lively, but smooth, snappy and refreshing. A medium to aggressive carbonation added some prickly goodness while the peppery spice did bring forth a slight bite at the back end. A good deal of flavor was left behind on the palate after each sip. Overall, I thought that this brew was very good. It really went well on this humid evening here in Kentucky. It had plenty of the proper flavorings and aromas of a Belgian-styled pale ale without ever becoming so complicated that it was bothersome to drink. The ease at which I was able to digest it was rather scary. I would definitely like to pick it up again sometime this Summer to enjoy around the BBQ. 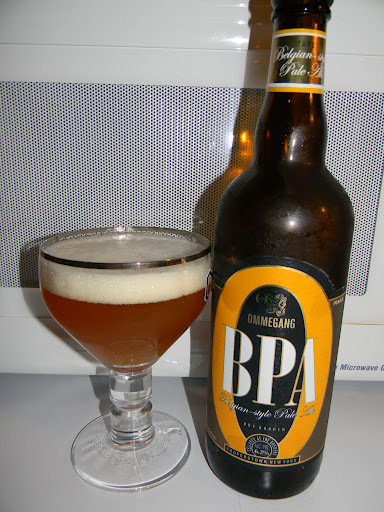 I wouldn’t hesitate a bit to tell a friend to give the Ommegang BPA a try. I think it could be enjoyed by experienced craft beer drinkers as well as those who may not be as well versed. If you’ve had it…. what did you think? Did you enjoy it? Be sure to leave me a comment and tell me your opinion.